As we're getting more traffic to the Jetpac home page (thanks AllThingsD!) optimizing our conversion rate has become a priority. In our case, the action we want people to take is connecting with Facebook, so we're having to work quite hard to figure out what messages work best to persuade people. In previous projects, it's often been quite a surprise exactly what sentences work, and so the only way is to test a lot of different approaches and see which strike a chord. When the page is first loaded, the inner HTML of the elements with those class names is replaced with a randomly-selected string from the array, and the choice is stored with KissMetrics so we can see which ones convert best in the reports. I also store the choices in cookies so that repeat visitors see the same text, and we don't pollute the metrics with varying choices. 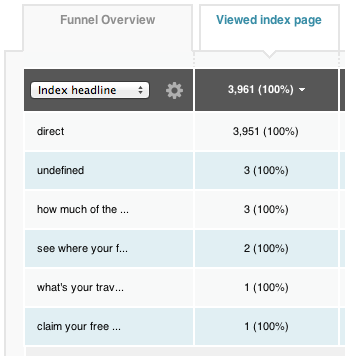 Once the data has had a chance to percolate through Kiss's servers, you can choose the class name from the drop-down menu below 'Funnel Overview' on the report page and see which of the messages had the best conversion rate.